Originally published under the title, "Born in Lebanon, Dying in Syria?" Hizballah Secretary General Hassan Nasrallah declared in a May 24 speech that his Lebanese Shia movement's fighters will deploy to "all the places in Syria that this battle requires." The latest reports from the Qalamoun mountain range in western Syria suggest that Hizballah is pushing back the jihadis of Jabhat al-Nusra and Islamic State. The movement claims to have taken 300 square kilometers from the Sunni rebels. The broader picture for the Shia Islamists that dominate Lebanon, however, is less rosy. The Iran-led alliance of which Hizballah is a part is better organized and more effectively commanded than its Sunni rivals. Its ability to marshal its resources in a centralized and effective way is what has enabled it to preserve the Assad regime in Syria until now. When Assad was in trouble in late 2012, an increased Hizballah mobilization into Syria, and the creation by Iran of new, paramilitary formations for the regime recruited from minority communities, was enough to turn the tide of war back against the rebels by mid-2013. Now, however, the numerical advantage of the Sunnis in Syria is once more reversing the direction of the war. With the minority communities that formed the core of Assad's support no longer willing or able to supply him with the required manpower, the burden looks set to fall yet further on the shoulders of Assad's Lebanese friends. The Iran-led alliance is better organized and more effectively commanded than its Sunni rivals. What this is likely to mean for Hizballah is that it will be called on to deploy further and deeper into Syria than has previously been the case. In the past, its involvement was largely confined to areas of particular importance to the movement itself. Hizballah fought to keep the rebels away from the Lebanese border, and to secure the highways between the western coastal areas and Damascus. The movement's conquest of the border town of Qusayr in June 2013, for example, formed a pivotal moment in the recovery of the regime's fortunes at that time. But now, Hizballah cannot assume that other pro-regime elements will hold back the rebels in areas beyond the Syria-Lebanese frontier. This means that the limited achievement in Qalamoun will prove Pyrrhic unless the regime's interest can be protected further afield. Hizballah looks set to be drawn further and deeper into the Syrian quagmire. Movement Secretary-General Hassan Nasrallah acknowledged this prospect in his speech last Sunday, marking 15 years since Israel's withdrawal from southern Lebanon. 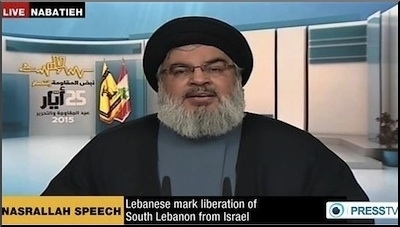 In the speech, Nasrallah broadened the definition of Hizballah's engagement in Syria. Once, the involvement was expressed in limited sectarian terms (e.g. the need to protect the tomb of Sayida Zeinab in Damascus from desecration.) This justification then gave way to the claimed need to cross the border so as to seal war-torn Syria off from Lebanon and keep the Sunni "takfiris" at bay. Nasrallah broadened the mandate of Hizballah's engagement in Syria in a May 24 speech. On Sunday, Nasrallah struck an altogether more ambitious tone. Hizballah, he said, was fighting alongside its 'Syrian brothers, alongside the army and the people and the popular resistance in Damascus and Aleppo and Deir Ezzor and Qusayr and Hasakeh and Idlib. We are present today in many places and we will be present in all the places in Syria that this battle requires." The list of locations includes areas in Syria's remote north and east, many hundreds of kilometers from Lebanon (Hasakeh, Deir Ezzor), alongside regions previously seen as locations for the group's involvement. Nasrallah painted the threat of the Islamic State in apocalyptic terms. He described the danger represented by the group as one 'unprecedented in history, which targets humanity itself." This language sounds fairly clearly like a preparing of the ground for a larger and deeper deployment of Hizballah fighters into Syria. Such a deployment will inevitably come at a cost to the movement. Only the starkest and most urgent threats of the kind Nasrallah is now invoking could be used to justify it to Hizballah's own public. The problem from Hizballah's point of view is that it too does not have inexhaustible sources of manpower. The movement has lost, according to regional media reports, around 1,000 fighters in Syria since the beginning of its deployment there. At any given time, around 5,000 Hizballah men are inside the country, with a fairly rapid rotation of manpower. Around 1,000 Hizballah fighters have died in Syria. Around 5,000 are inside the country at any given time. Hizballah's entire force is thought to number around 20,000 fighters. Faced with a task of strategic magnitude and ever growing dimensions in Syria, there are indications that the movement is being forced to cast its net wider in its search for manpower. A recent report by Myra Abdallah on the Now Lebanon website (associated with anti-Hizballah elements in Lebanon) depicted the party offering financial inducements to youths from impoverished areas in the Lebanese Bekaa, in return for their signing up to fight for Hizballah in Syria. Now Lebanon quoted sums ranging from $500 to $2000 as being offered to these young men in return for their enlistment. 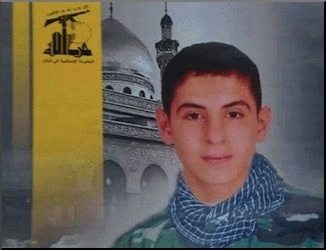 Earlier this month, Hizballah media eulogized a 15 year old boy, Mashhur Shams al-Din, who was reported as having died while performing his 'jihadi duties' (the term usually used when the movement's men are killed in Syria). 15-year-old Mashhur Shams al-Din was recently eulogized by Hizballah media for having died while performing his "jihadi duties" in Syria. All this suggests that Hizballah understands that a formidable task lies before it, and that it is preparing its resources and its public opinion for the performance of this task. As this takes place, Hizballah seems keen to remind its supporters and the Lebanese public of the laurels it once wore in the days when it fought Israel. The pro-Hizballah newspaper Al-Safir recently gained exclusive access to elements of the extensive infrastructure Hizballah has constructed south of the Litani River since 2006. The movement's al-Manar TV station ran an (apparently doctored) piece of footage this week purporting to show Hizballah supporters filming a Merkava tank at Har Dov. Nasrallah in his speech also sought to invoke the Israeli enemy, declaring that ISIS was 'as evil' as Israel. The Israeli assessment is that with its hands full in Syria, Hizballah will be unlikely to seek renewed confrontation with Israel. It is worth noting, nevertheless, that a series of public statements in recent weeks from former and serving Israeli security officials have delivered a similar message regarding the scope and depth of the Israeli response should a new war between Hizballah and Israel erupt. IAF commander Amir Eshel, former IAF and Military Intelligence Head Amos Yadlin, Major-General Giora Eiland and other officials speaking off the record expressed themselves similarly in this regard. Hizballah, clearly, has little choice regarding its deepening involvement in Syria, Nasrallah's exhortations notwithstanding. The organization is part of a formidable, if now somewhat overstretched regional alliance, led by the Islamic Republic of Iran. This alliance regards the preservation of the Assad regime's rule over at least part of Syria as a matter of primary strategic importance. Hizballah and the Shia it is now recruiting are tools in this task. It would be quite mistaken to underestimate the efficacy of the movement. It is gearing up for a mighty task that it intends to achieve. Certainly, many more Hizballah men will lose their lives before the fighting in Syria ends, however it eventually does end. Given the stated ambitions of that movement regarding Israel and the Jews, it is fair to say that this fact will be causing few cries of anguish south of the border.